Mike Disfarmer, born Michael Meyer in 1884, changed his name to distance himself from the community in which he grew up, even going so far as to claim that he'd been blown into the family home by a tornado. 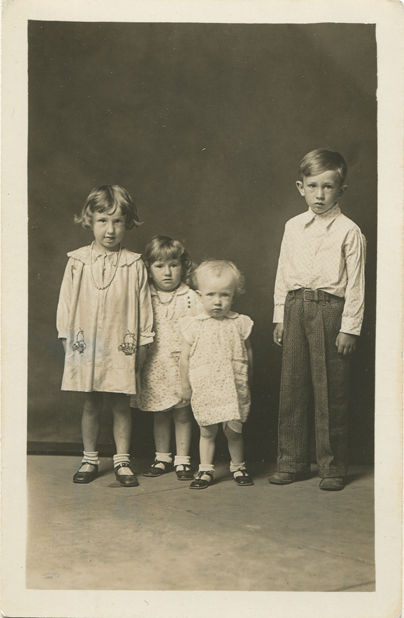 For over forty years he was the local photographer in Heber Springs, Arkansas, making inexpensive studio photos to satisfy the needs and whims of his rural neighbours; in doing so he developed a distinctive style and well-honed sensibility which made him one of the masters of American portrait photography. At first, many of Mike Disfarmer's photographs seem familiar; they bring to mind well-known images of southern American communities in the Depression years. A closer look reveals their singularity: these are portraits of people who are happy to have their pictures taken and are content to pay for them. They are people who are keen to impress and look their best, because the photos were made to be shared with family, friends, and sweethearts. There is no artifice or guile in Disfarmer's images, and they can be unforgiving in their scrupulous gaze. And yet - this explains much of their beauty - they can be full of grace and dignity, just as they are unwavering in their tolerance and acceptance of difference. They are also, at times, curiously sensuous photographs. Surprisingly, because their maker was a loner and outsider, these photographs are about connectedness. They are a form of friendship. Mike Disfarmer's photographs are well-known in America but less celebrated in Europe. There are several websites devoted to his work, a puppet theatre inspired by his life and photography, and an album of music by Bill Frisell that is dedicated to him. This is the first time that his photographs have been exhibited in Ireland; the prints in the show are vintage and have been lent by Steven Kasher, New York, whose help and advice are warmly appreciated.